I’ve been a fan of Writer/Director Darren Lynn Bousman for awhile now. He’s taken on some very interesting material and done his own thing with it. I felt his “Saw II” was the best of the franchise. “Repo! the Genetic Opera” was a highly entertaining dark horror musical and his recent remake of “Mother’s Day” easily bested the Troma original. 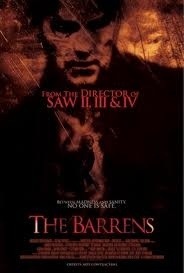 I was interested in seeing what awaited me in “The Barrens”. 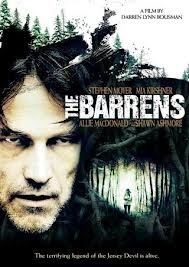 The film is about a father (played by “True Blood” actor Stephen Moyer) who takes his daughter and his new wife on a camping trip to the New Jersey Barrens. Unbeknownst to his family (and himself) he had contacted rabies earlier and begins to believe that his family is being stalked by the legendary Jersey Devil. As he becomes inceasingly erratic, he begins to wonder of the Devil is real or all in his head. In addition to Moyer, the cast features Shawn Ashmore (from the excellent “Frozen”, Iceman (ironic) in the “X-Men” films, and he even played Terry Fox in the TV film “Terry”), Mia Kirshner (“The L Word”, “24”, “The Vampire Diaries”) and Erik Knudsen (“Saw II”, “Scott Pilgrim vs the World” and “Scream 4”). The acting is all done well, anchoring the movies’ delirious plot. I knew next to nothing about this film before deciding to watch it. It wasn’t originally in my list of 31 films, but I trust Bousman and had read a few positive reviews. I’m also a sucker for a movie involving a mythical creature. There aren’t too many good ones, so it’s best to jump on a potentially good one when it presents itself. I must say, I thoroughly enjoyed this film. The acting is good, plot intriguing and the directing is excellent. Bousman has cut his teeth on the “Saw” series, but he’s really gotten to spread his wings, working within his means to make the films he wants to make. I really respect that, and it doesn’t hurt that the man knows how to craft a good story and flesh it out on screen. 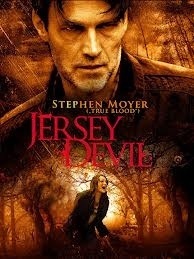 The slow descent into rabies fueled delirium is done quite effectively, to the point that I wasn’t sure whether I wanted there to be a Jersey Devil or not ! 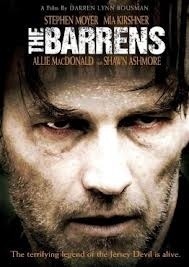 There are questionable decisions, and you’ll either go with the ending or you won’t, but for a film that (for me) came out of nowhere (and pretty much went direct to video) “The Barrens” is a real treat. 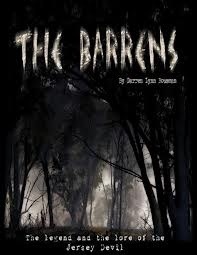 This entry was posted in Reviews and tagged 2012, barrens, blood, cult, devil, frozen, gore, guys, Halloween, Horror, indie, jersey, mystery, October, repo, review, saw, thriller, Troma, true blood, x men by lazron. Bookmark the permalink.